this past week, I had fab opportunity to do something I had always wanted to do. Since a small kid I had always wanted to crash a Ladies only event, just for the sheer fact and fun of having a true, no holds barred, GIRLS night out, so, well the time came, I finally got my chance! The Village Country Club last week hosted an all glam, all fun, all ladies evening, an inner circle connection i had made weeks prior was able to bend the rules for this little “in the city” boy. I couldn’t wait to see what it would be like to run with the big girls. It was the 2nd annual Ladies Nigh Out, and from what I heard last year its was a hit, so this year in true diva style, it had to be topped, and boy “I mean girl” it did! i walked in and the tidal wave of girls hit me like a tun of bricks, from all the single ladies, to the Soccer Mom’s pushing JEEP strollers while balancing their Birkins with the one shoulder trick, Truth be told i had it in my mind that it was going to be a small event, benefiting the Lincoln Property Charites, but I was so wrong. The night started with fab make over sessons with none other than Dallas’ own makeup Guru Waylon Tate. Waylon’s portable makeup counter had a line that stretched almost to The Village pool, in my mind i knew it would be impossible for Waylon to makeover all these women, but by the end of the night i understood why they call him a guru, for he made the impossible possible, and every gal was done up, in CHANEL no less ! Moving over to other sections that were filled with every fashion item possible, my long time fantasy of knowing what women did at these “ladies night outs” was beginning to be fulfilled ten times over. The enviroment was saturated with all things Girly, as I made my way through all the make shift booths of fashion, home decor, and Jewelry I felt it was time to get my shop on, as if it was Fashion’s night out all over again. 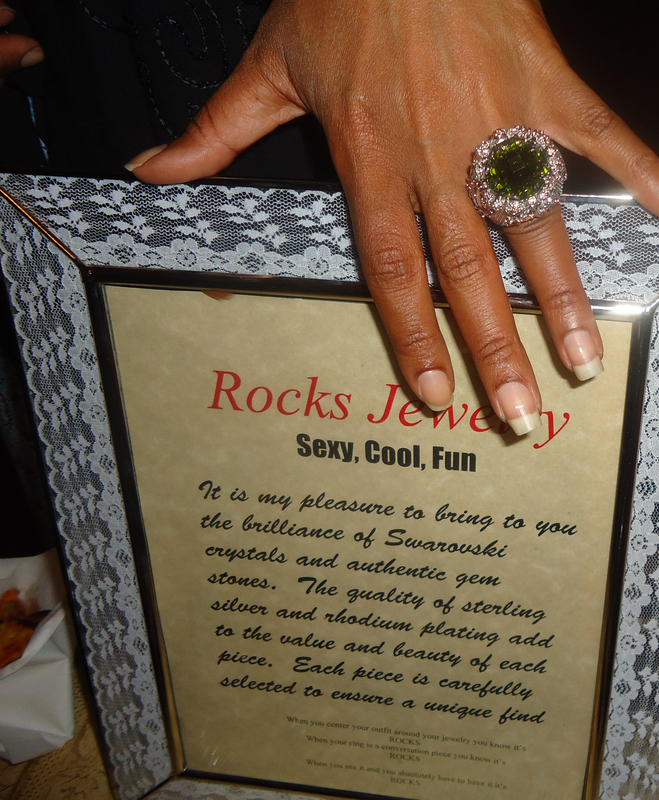 A popular local jeweler , Rocks Jewelry, that can be found on Dallas’ Symphony shop, was a true distraction from the drinks being hand out. The size of thoughs rocks had every women waiting in line with cash and card in hand, and then even more colorful cocktails finally made their appearance, and the night truley got started. Lady Gaga blasting the tunes, and tiny food with soup bowl sized drinks, i was feeling like a “NATURAL WOMEN”. I had a chance to sit down with the minds behind the 2nd annual Ladies night out, Chante Mayorga and Deanne Ashcraft, for weeks I told both that the anticipation for the event had been building among those who live in the village, the turn out was far beyond that of last years’. As Chante and I spoke of the chic sponsors the event had this year, made the night even more Glam, Lululemonm, Lush, Origins among others. Those gift bags for sure were sought after through the whole night. Chante went on to explain how with this year’s turn out the Lincoln Property Charities will sure help in the holiday season, a future event is planned, which of course I will attend. Deanne Ashcraft meeting however was in one sentence intervals, given she was the power house behind the event, from running around all night making sure everyone had one of those coveted gift bags all the while maintaining a Real Housewife hostess charm, like they say Behind every great event, there’s an even greater woman, this is so the case…women for sure Took over the night! The shopping booths all located in the Village for the night created the atmosphere of shop till you drop, Origins practically created an entire store front I was amazed, my kudos to Wolf Chapa of Origins Northpark, for practically bringing the store with him. all in all the festivities were so much fun, however I was clocked by one woman, as this “newsboy “made his way through the foodies and cocktails, she shouts “Your not a lady”…however, after I got her name, she got a tad nervous when I told her I was the press, her tone quickly changed and offered her Lush bath fizz ball over to me (strange) in exchange for mercy, but I declined considering her tension at the start of our conversation, I figured she needed the stress reliever fizz ball more than I did, great gal though, but one cocktail to short of being chill. The night was slowly coming to a close, as I made my way over to the exit, a thin chic gal ran through the door, her timing only left her feeling Tardy for the Party, my run in with her ended up being the highlight of my night. Miranda Harper, local fashion designer and fellow blogger in all things fab, completed my ladies night. We sat down to chat, “naturally”, of the who’s who and the whats what of DFW Fashion, she then shared with me the launch of her upcoming blog, and needless to say I love a good sneak peak, Emm8 Takes Over will for sure be the new Obsession of DFW style, not to mention it will for sure makes it way to many of DFW’s Style Divas favorite site list. This creative gem is soon to explode, of course I extended my famous invitation for a Coffee conversation, so look out soon for an Emm8 Takes Over exclusive, such a perfect way to end such a Glam night. as I made my way home, with my CHANEL makeover (what? was I only suppose to watch), and Lush Fizz ball I couldn’t help but think…OH what a night, Ladies are so much fun…if any of my fellow Male inhabitants ever get a chance to crash a ladies night, Do it! This entry was posted in | and tagged DALLAS, DFW, fashion, fashion scene, laides night out. Bookmark the permalink. Ищете у кого обещать исправление окон в Казани? Мастера компании “2 ОКНА” работают семь дней в неделю с 9:00 прежде 21:00. Выезжаем на объект в течение нескольких часов потом обращения, работаем с поломками любой сложности, предоставляем 1 год гарантии для исправление и 5 лет для монтаж произведенных нами изделий. Заполните заявку для сайте и получите скидку 5%! Youur tyle is so unique in comparison to other people I have red stuff from. just book mafk this blog. beautiful. You are a poet indeed. You made my day, sir! Coffee invitation accepted.